Series Three Episode Four of the ICQ Podcast has been released. The latest news, your feedback, upcoming Events and Martin (M1MRB) discusses building the TenTec 1330. Once your TenTec arrives you realise you have made a good choice. The package was well packed for shipping by the UK suppler and arrived undamaged. On unpacking the shipping box you find the whole is contained within a large plastic bag. This means thing do not get lost during shipping. The Reference section covers the radio specification and parts list. There is also an overview of the various sections of the radio giving you a better understanding of how this Radio works. The Assembly Section is split into eight phases. Each phase completes a section of the radio and concludes with a tests to confirm you work is correct. The back page has useful information for all radio amateurs. The bag also contains an A3 circuit diagram and component layouts. This is very useful when you start construction because you don't have to keep changing pages during construction. Because this kit has been out some time component go out of stock, equivalents are supplied for some items. There are supplementary sheets outlining this information. Please read the manual before starting, this will save you time in the long run. I also made changes in pencil from supplementary sheets so that the information was in one place. The first thing you need to do is to unpack the radio and do an inventory to insure you have all the parts before building. The radio comes shrunk wrapped with all the components inside the case. Unwrap the case and using the Reference section of the manual perform an inventory sorting, components ready for building. This will take you over an hour if done properly but this sections is like laying down the foundations. At the end of each section you are given details of how to test your work. Sometimes you are given a number of different ways of achieving the same results depending on what equipment you own. 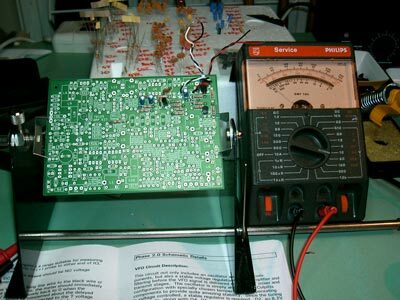 If you have test equipment, use it. If not use the other options. This is probably the easiest part of this kit and very you should have no problems with this section. This phase builds the RX/TX switching. Install components in the order they appear in the manual. Tick the manual after installing each component to ensure you don't miss any. The construction and testing of the VFO is easily an evening project by it's self . Allow time to complete and test this phase and don't rush. This is the heart of the projects performance. Install components in the order they appear in the manual. Tick the manual after installing each component to ensure you don't miss any. The manual explains how to wind the VFO toroid and you should have now problems completing this phase. The VFO should cover 50khz and on the 30 metre band this is the whole of the allocation. When you are happy you have completed this set up you can then move on to the next Phase. Completion of this phase will give us a low-level transmit stage after the VFO. Once complete you will be able to hear the output on another radio in the 30 metre band. Ther are not too many components in this phase and it can be completed in about 30 minutes. Take care when installing the mixer IC u4 (NE612) to get it the correct way round. The Receiver IF is made with 4 * 14.31818 Mhz crystals configured as a four pole crystal filter. Care must be taken when constructing this phase because there is no testing procedure for this phase.